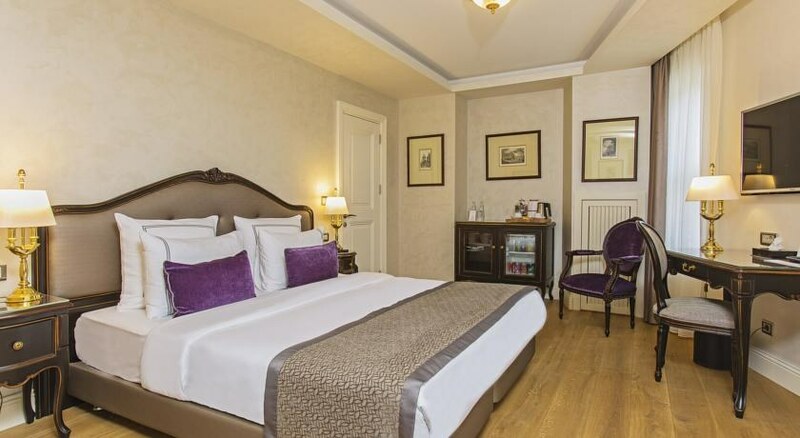 The Nar Suites Pera Hotel is a compact attractive hotel located in the heart of the Beyoglu district of Istanbul City, Turkey, a 2-minute walk from the Galata Tower and within easy reach on foot or by tram of the many city attractions. 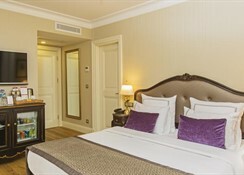 Having only 20 smart rooms, the Nar Suites Pera Hotel offers you attentive service and information to ensure you make the most of your stay in Istanbul. A breakfast buffet sets you on your way, you can enjoy a restaurant and bar service as an alternative to the many venues in the neighbourhood and a library and sun terrace with stunning views provides relaxation and a chance to reflect on your city experience. Book into the Nar Suites Pera Hotel at Beyoglu and step outside to absorb the intensity of Istanbul's rich Turkish culture and history. 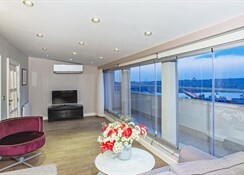 Getting to the hotel: 19km from Istanbul Ataturk International Airport; and 42km from Sabiha Gökçen International Airport. 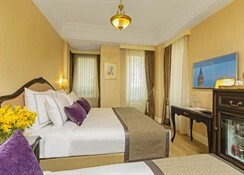 Local tips: Nar Suites Pera is just a 15-minute walk from Taksim Square and less than 5 minutes' walk away from the renowned Istiklal Street's shops. Food, drink and entertainment: A rich breakfast buffet is served and an a la carte restaurant offers national and international cuisine options and caters for dietary needs on request, bar service, library and sun terrace. 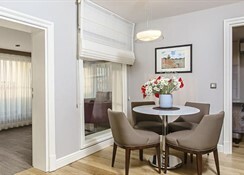 Additional: 24 hour Front Desk services, housekeeping, room service, currency exchange, free WiFi internet access throughout, Concierge service, tour desk, laundry, ironing & dry cleaning service, air-conditioning, car hire, fax & copy service, luggage storage, safe boxes, newspapers available, a free shuttle service and free public parking is possible nearby. Guest rooms are modern and generous in space with interiors of soft pastel shades contrasting with warm fabric patterns, bed covers add some bold colour and white drapes lighten the ambience, smart furnishings on smooth parquet flooring and modern amenities provide for your comfort and convenience; features include floor-to-ceiling windows, air-conditioning and heating, en suite bathroom with shower, hair dryer and toiletries, free WiFi internet, satellite TV, radio, telephone, wake-up service/alarm clock, wardrobe/closet, mini fridge, electric kettle, desk and seating. 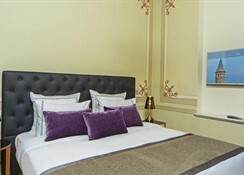 Room choices are Single, Twin and Triple with land view and Double and Triple Suite rooms with land view.